You begin each chapter in your book with a story; anything from the sci-fi film Splice, to the French-language film Ma Vie en Rose, to the life of Angelina Jolie! Why did you take that approach? The topics we cover in the book are complex. Not only is talking about kinship always complex, but our aim for the book was to draw upon posthumanist theorising to extend our understanding of kinship beyond humans, and to critically examine Western human understandings of kinship. The stories gave us a way to introduce these complex ideas in a simpler way. We were able to pick out key parts from each story that highlighted the arguments we were making in each chapter, so that they were readily accessible from the onset. We wanted the book to be an accessible introduction to the field. We felt that using stories to open the theoretical chapters, as well as the topical content (of cross-species kinship, donor connections, loss, motherhood and recognition and institutional contexts) was a unifying and engaging approach. What’s critical about the kinship studies you’re interested in? 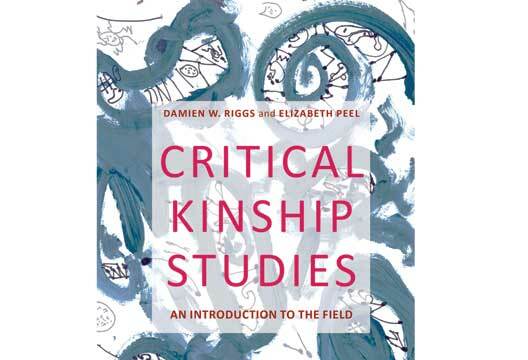 As we note in the book, critical kinship studies has been a ‘thing’ for quite some time in other disciplines. Key thinkers such as Marilyn Strathern, Janet Carstens and Sarah Franklin have long critiqued the idea that kinship is a taken-for-granted fact rooted in biology, and instead have demonstrated how claims to kinship are ‘worked up’ in specific contexts. Our interest in writing the book was to bring together this work, that of others, and our own, under a recognisable badging. From our viewpoint, what makes the badging deserving of the term ‘critical’ is that it questions the taken-for-grantedness of kinship, looks at kinship beyond human–human relationships, and includes diverse groups who are often excluded from more mainstream literature on families and relationships. I was particularly struck by the chapter on kinship and loss, and I am pleased we have an extract from that below (concerning narratives of pregnancy loss). As we note in the book, loss is a common feature of human life. Loss differs, however, across cultures, and is dependent on the object that is lost. We were particularly interested in how in Western cultures certain losses are acknowledged and indeed valorised, whilst other losses are minimised or dismissed. For example, whilst petkeeping is a continually growing norm in Western cultures, spaces for mourning the loss of an animal are still marginalised. Spaces for recognising how one animal might mourn the loss of another are almost non-existent. And in terms of the discussion of pregnancy you mention, as medical technologies and prenatal imaging develop, parents are increasingly invested in their unborn child from a much earlier point in the pregnancy, being able to ‘see’ the child and thus visualise a ‘dream’ for their child and for themselves as parents to be. Yet for people who experience a pregnancy loss, the common response by friends and family is ‘You can have another’. Pregnancy loss remains very much a culturally silenced narrative. And loss doesn’t have to be simply about death? Exactly. Narratives of loss abound. For example, there is a growing body of literature – both academic and popular – that frames loss as a ‘natural’ response by parents of transgender children. Parents of transgender children are expected to experience their child as producing a loss of dreams or expectations of what their life would be like. We argue that such accounts locate loss in the wrong place. It is not transgender children who produce a loss, rather it is the broader context of cisgenderism – the ideology that denies people’s own understandings of their bodies and genders – that produces any sense of loss. What cisgender parents lose, then, is the privilege that comes from occupying a normative place in the world. Similarly for parents of those with a diagnosis of autism, it is the loss of a fantasised child that is the hardest to come to terms with, not the behaviours or personality of the child themselves. The mothers we interviewed struggled to reconcile their love for their child, and in many cases their staunch advocacy for the rights of their child, with a sense of ‘devastation’ at the diagnosis. So on the one hand, a diagnosis can facilitate access to support and services, whilst on the other hand it can cement the fears that the mothers had about their child’s neuroatypicality. It’s the gateway to acknowledging feelings of loss, but this sense of loss is a product of a broader social context in which neurotypicality is privileged. What binds these examples together? We were reliant upon Franklin’s (2013) understanding of kinship as a technology. Her understanding of kinship as a technology focuses on the ways in which claims to kinship produce particular ways of being, and naturalise particular relationships. In differing ways, all of the accounts of loss we outlined are produced in comparison to a particular idealised account of kinship, one in which the self is reproduced through a human child. Surely not all parents and people react in these ways though? Of course, personhood is attributed to non-human animals by some humans, and some intending parents attribute personhood to unborn children. In this sense, meaning is made despite it not necessarily being valued by society at large. One manifestation of this meaning-making is seen, for example, in private (or semi-private) forms of memorialisation to – in some cases literally via tattoos – mark the lost children of intending parents, or to signify the loss of an animal companion. Bearing in mind your critical stance, what ways forward do you see with regard to speaking about loss in different ways? In the book we argued that loss is foundational to kinship because kinship is a fantasy – an illusion. If we think about Western narratives of finding our ‘other half’, for example, we can see how many of us come to determine our own worth via such narratives. Loss can thus be present for people who are unable to achieve this fantasy of another half, whether because they are unlucky in love, or they are in love but feel unsatisfied. Either way, in speaking about kinship as a fantasy, our aim was to critically examine normative fantasies whilst not letting this lead us into denying the losses that people experience. In other words, our point was not to theorise loss away, or to deny its existence. Rather, in Critical Kinship Studies our interest was to look at what gets pushed to the sidelines when only certain forms of loss are acknowledged, or when loss becomes an expected narrative. More broadly, at least in the chapter reproduced here, our aim was to consider what it might mean to think about kinship if we both acknowledge loss as foundational (in terms of fantasy), but also think about as a concrete experience that is variously acknowledged or denied. And it is this pairing – of the loss of a fantasy and the ‘reality’ of the loss of that fantasy – that we believe requires further thought and critical investigation. - The following is an extract from Riggs, Damien, and Peel, Elizabeth: Critical Kinship Studies, published 2016 by Palgrave Macmillan and reproduced here with their kind permission. For your chance to win a copy of the book, keep an eye on Twitter @psychmag. Heterosexual couples planning for a first child often frame their desire for a child in terms of the dreams they have for the future, and the normative expectation that a child constitutes a core aspect of such dreams. It is not surprising, then, that for many people who experience a pregnancy loss, what is lost is not simply a child, but also a dream about an idealized life. Yet despite the significance of such loss, and similar to the loss of a companion animal, pregnancy loss remains something of a silenced narrative in Western societies (Layne, 2003). In part, this is because of the problems associated with according personhood to the unborn. As Julia Frost and colleagues (2007) suggest, at first glance it may appear that apportioning personhood to unborn children in the context of pregnancy loss runs the risk of undermining abortion rights, which are often opposed through an emphasis on the personhood of the fetus. Frost and colleagues, however, suggest that personhood is a relational and social construct, and thus it is entirely possible that in some contexts the personhood of a fetus may be evoked, when in others it may not. In a technologically and medically advanced society such as the United States, we can detect and see life at earlier stages than ever before, making the pregnancy ‘real’ at an earlier gestational period than ever before. This outcome results in the formation of early mother–child attachments that result in a higher expectation that a pregnancy will result in a live birth than is statistically likely to be the case. Once it is known that there is a pregnancy and the fetus can be ‘seen’, it may be difficult to acknowledge that many factors still exist that could stop the process of development (p. 68). A large body of literature reveals that women who have miscarried report friends and family responding in ways that reduce or deny the importance of the event, leaving the grieving woman with little sense of support. In addition, the experiences reported by these women are quite different from those reported by individuals who have experienced other types of loss (e.g. spouse or parent). For example, others rarely respond to the loss of a partner or spouse with the statement ‘You can have another’, yet this is a common response to a woman who has had a miscarriage (p. 66). The idea that one person is replaceable with another is replete across both lay understandings of pregnancy loss and the loss of an animal companion, as exemplified in films and television programmes where those who have experienced either form of loss are encouraged to ‘try again’ (for a pregnancy/child) or ‘get another’ (animal companion). What falls to the wayside in these types of responses are the dreams, experiences, and indeed kinship that may be experienced prior to the loss, and which, for many people, cannot be simply replaced by another pregnancy or companion animal. Erin: My journey has been a very long journey. I had trouble letting go. I spoke to the counsellors and they said ‘I think you were as much in love with the idea of a baby as much as you loved this baby’, because I had invested so much in her. From the moment I was pregnant, the whole world revolved around her […] I think my grief has been extended because I also have all those pink dreams that have not been fulfilled. I desperately wanted a girl. And so I have still got some unfulfilled sort of stuff, which is never going to happen now. I have got two boys, they are beautiful, but I desperately wanted a girl. Maria: I think from the fi rst moment I saw her [on the ultrasound] I knew her. And I also felt like I knew who she was going to become. She moved when I played certain music or watched certain movies. So I felt already that I knew what interests she would have. So the loss has been profound – I have lost the person I thought she would be. And I know it is all just what I made of a whole lot of little things, but that doesn’t change the fact that she felt like a person to me. Of course the problem is that the idea of what she was going to be was all mine, and so there is no one else who knew her like I did, so no one else who understands the loss. Leigh: For me it was all about the loss of control. I am a very organized person. Everything in my life has been planned, nothing had ever gone awry. And then this threw a whole spanner in the works because no matter how hard I tried, I couldn’t control what happened. And so that sense of being out of control hit me hard as well. And I am a perfectionist, so you know, everything I had decided in life before that, I had achieved. I had never tried so hard at anything. It didn’t take very long to get pregnant. I was very conscientious. I ate the right things, I did everything the book said. Never tried so hard to do something so perfectly, and it fell apart. That and you lose all your hopes and dreams for that baby. We would, of course, acknowledge that narratives of control are specifically Western-centric accounts of personhood (Riggs 2005). That Leigh perceived herself as someone who achieved things, and that a pregnancy loss undermined that sense of achievement, is a perception highly shaped by a cultural context in which achievement is valorized. Nonetheless, Leigh cannot be fairly expected to view her life outside of the cultural contexts in which she lives, contexts in which the having of children is socially sanctioned, and in which reproductivity is a hallmark of citizenship (Turner 2001). Yet, as we shall see in the following sections on narratives of loss among parents of transgender children and those with an autism diagnosis, the ‘achievement’ of having a child appears not to be solely determined by conception and birth. Rather, it increasingly appears to be the case that children are then expected to conform to a particular cultural narrative of Western personhood, otherwise they, too, are experienced as a loss.